[126 Pages Report] The application hosting market accounted for USD 36.91 Billion in 2016 and is projected to reach USD 72.50 Billion by 2022, at a Compound Annual Growth Rate (CAGR) of 12.2% during the forecast period. The base year considered for the study is 2016, and the forecast period considered is 2017–2022. The research methodology used to estimate and forecast the application hosting market began with capturing data from the key vendor revenues and the market size of the individual segments through secondary sources, industry associations, and trade journals, such as the Technology Services Industry Association (TSIA) and the World Information Technology and Services Alliance (WITSA). The bottom-up procedure was employed to arrive at the overall market size of the market from the individual segments. After arriving at the overall market size, the total market was split into several segments and subsegments, which were then verified through primary research by conducting extensive interviews with key industry personnel, such as Chief Executive Officers (CEOs), Vice Presidents (VPs), directors, and executives. The data triangulation and market breakdown procedures were employed to complete the overall market engineering process and arrive at the exact statistics for all the segments and subsegments. The application hosting market ecosystem includes several players, such as AWS (US), IBM (US), Rackspace (US), Google (US), Liquid Web (US), Microsoft (US), Sungard AS (US), DXC (US), Apprenda (US), and Navisite (US). The application hosting market considers the market size of the hosting type, service type, application type, vertical, organization size, and region segments to arrive at the global market size of the market during the forecast period. 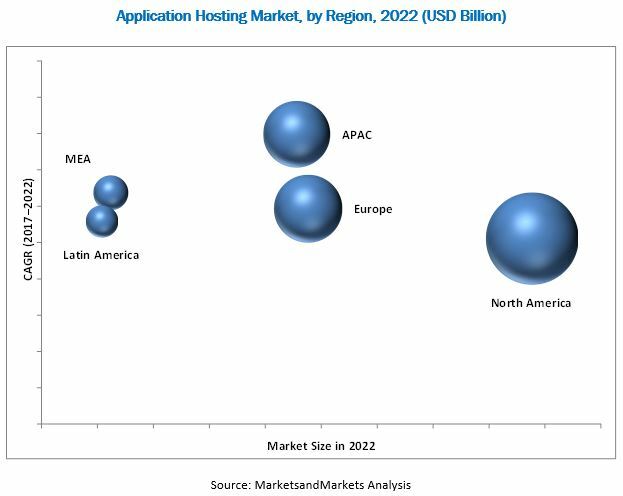 The application hosting market size is estimated to be valued at USD 40.81 Billion in 2017 and is projected to reach USD 72.50 Billion by 2022, at a Compound Annual Growth Rate (CAGR) of 12.2% during the forecast period. The major factors expected to drive the growth of the market include the availability of comprehensive hosting solutions with an array of complementing services over the core offering, and the software-centered competitive advantage approach. The scope of the report covers the application hosting market analysis by hosting type, service type, application type, vertical, organization size, and region. Managed hosting services provide a single-tenant dedicated environment for enterprises’ business-critical applications in a cost-effective manner. They enhance the performance, control, and security of applications and enable enterprises to focus on their core business activities. By transferring the workload to managed hosting providers, enterprises can reduce costs and receive maximum uptime for their applications. The mobile-based application type is expected to grow at a faster rate, due to the increasing adoption and deployment of applications in the mobile environment. The rising number of smartphones across the globe has compelled organizations to invest in mobile applications. Mobile applications are now one of the main components of enterprises’ growth strategy. Furthermore, mobile applications in various industries, such as banking and eCommerce, help increase the sales of products and also enhance customer services. These applications require high security and maximum uptime. Therefore, companies are investing heavily in application hosting services. The large enterprises segment is expected to have the larger market size during the forecast period. Large enterprises are highly focused on data security and data security compliances. Therefore, they are investing heavily in securing the external hosting infrastructure and associated services. They are also deploying various customer-centric and business-centric applications to gain a competitive advantage over the other market players. The Banking, Financial Services, and Insurance (BFSI) vertical is estimated to have the largest market share in 2017, due to the adoption of omnichannel business models. Moreover, enterprises in the BFSI vertical are expanding their service offerings across various delivery channels, such as internet banking and mobile banking. To ensure seamless functioning of mobile and web applications, banks need 100% uptime along with high data security. For this, they are partnering with some of the leading hosting service providers to transfer their workload to the cloud environment. Among the regions, North America is expected to hold the largest market share, due to the high concentration of application hosting providers in this region. Furthermore, the adoption of cloud hosting among companies in North America is high. Startups and large enterprises are preferably hosting their applications on the cloud. Furthermore, this region has a large number of colocation data centers that are supporting the growth of the application hosting market in this region. Asia Pacific (APAC) is expected to grow at the highest CAGR during the forecast period, as enterprises in the region are rapidly adopting new digital technologies in their business ecosystem. Furthermore, this region has a well-developed cloud infrastructure. Competitive pricing with a list of delivery models and myriad websites is expected to drive the market growth in APAC. The major factors that are expected to limit the growth of the application hosting market are regional IT development that is posing an infrastructural challenge for implementing the hosting technology, and global and local regulations that act as a barrier to market entry. The major vendors profiled in the report include AWS (US), IBM (US), Rackspace (US), Google (US), Liquid Web (US), Microsoft (US), Sungard AS (US), DXC (US), Apprenda (US), and Navisite (US).